On this day in 1776, eight years of occupation by British troops in Boston was brought to an end -with minimal blood shed – when General George Washington successfully placed fortifications and cannons at Dorchester Heights, a strategic spot over-looking the city from the south. During the Siege on Boston, when the New England militia surrounded Boston to limit the movement of British troops after the Battles of Lexington and Concord in April 1775, action was limited to skirmishes, minor raids and occasional sniper fire. In June 1775 the Brits did manage to capture Breed and Bunker’s Hills, but they suffered heavy causalities and their efforts still weren’t enough to break the siege. By November of 1775, General Washington decided to send a soldier named Henry Knox to Fort Ticonderoga to bring heavy artillery captured from the enemy back to Boston. In an incredibly complex and dangerous operation, Knox managed to smuggle all the weaponry Washington needed into Boston right under the noses of the British in January 1776. General Washington had a plan, and it was genius. To serve as a diversion against the planned action at Dorchester Heights, Washington ordered several cannons to be placed in Cambridge (just outside the city) and in Roxbury. These cannons opened fire on Boston during the evenings of March 2nd and 3rd, resulting in no major casualties for either side, but causing just enough chaos to divert attention away from what was going on in Dorchester. On the night of March 4, 2,000 Colonial troops led by General John Thomas stealthily marched to Dorchester Heights and began fortifying the area. In order to muffle the noise, hay bales were placed between the path taken by the troops and the harbor. Another clever example of Yankee ingenuity was the construction of the outer works of the fortifications, such as rock filled barrels. Excellent protection, and, if needed, they could be rolled down the hill to take out a few enemy soldiers as well. General Washington was also on hand to provide moral support to the troops. By 4 a.m. on March 5, they were as ready as they would ever be. March 5, 1776 was also the sixth anniversary of the Boston massacre, a fact that Washington was quick to remind all present of. The rebels have done more in one night than my whole army would have done in a month. By day’s end, Howe reconsidered attacking at Dorchester Heights, and by March 8th he had sent word to General Washington that he planned to evacuate all British troops from Boston. Howe added that the British would not burn the city as they departed if allowed to leave without harassment. On March 17th, the British and Boston loyalists hopped a boat for Halifax, Nova Scotia, and American forces swarmed the city of Boston, which remained in American hands for the remainder of the Revolutionary War. 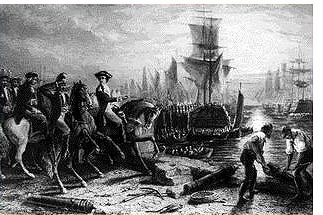 Evacuation Day is an official holiday in Suffolk County, MA, the county that Boston is located in. It’s also St. Patrick’s Day, meaning March 17th is a fine day to be a Bostonian.